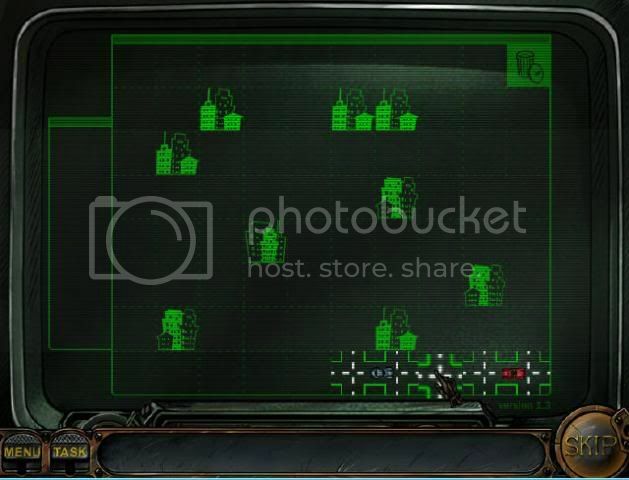 Click on the tiles in order to swap the pictures around. The pieces will not lock into place until you’ve completed the whole picture. 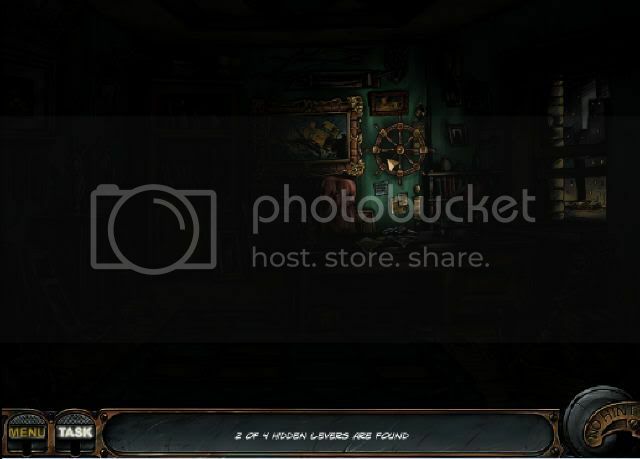 The pictures can be swapped in any order, you can click on them whether they are next to each other or not. 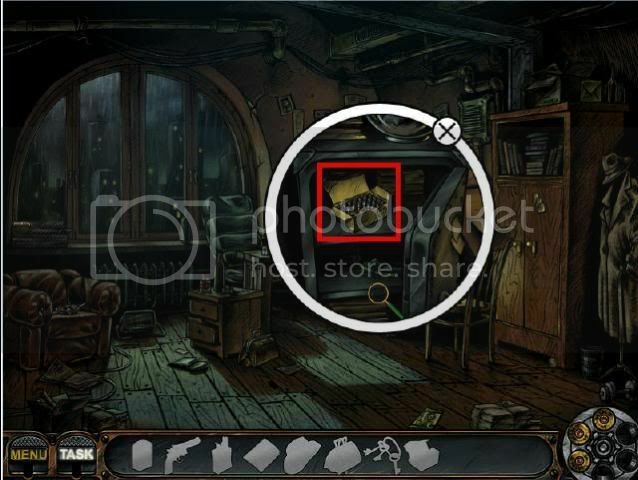 When the picture is complete, click on the gun that is flashing on the left side of the floor. Click on the top left side of the page and you will get a closer view of some books. Nick tells you that a few books are missing from the shelves. File the books according to their alphabetical name. Each time a book is the right place, a number will appear on the spine.You will use those numbers for the combination of the safe. Once you’re done with the numbers,leave that pop-up window open. Open the pop-up window for the safe by clicking on it. You want to enter the numbers on the safe in the same order that they are in on the books. You can have both windows open in order to enter the code. Once the code has been entered the safe will open automatically. 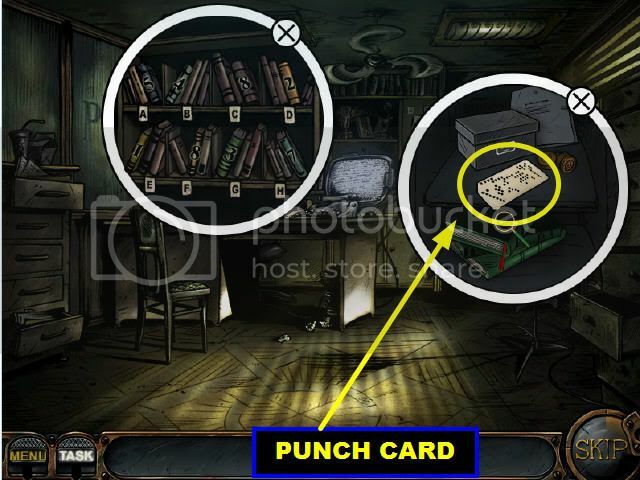 Click on the punch card that is inside. 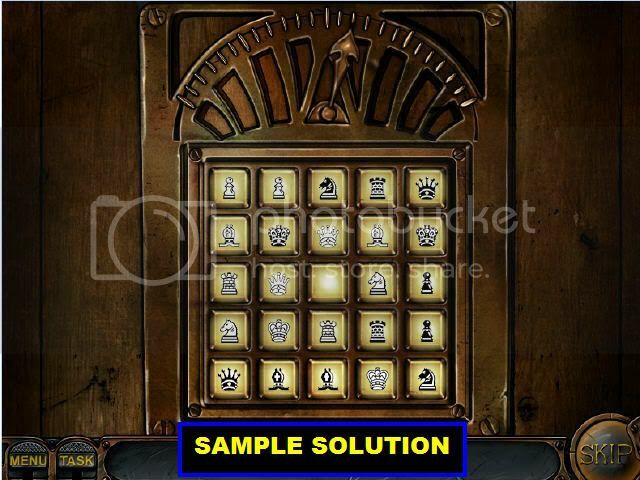 Place the punch card on the database and a new window will appear. It will ask you to enter the password. You can type in the answer by clicking on the keyboard that is on the scene or by entering the code on your own keyboard. You will enter whichever letter comes to mind. If the letter is in the password, it will show up on the monitor. if it’s not in the solution then that letter will go under the asterisks. There may be others and I will update the guide when I find them. The second word is always the same “FRANKIE” or “FATSO” are your two choices as far as I can see. As soon as you type that in, Frankie the Fatso’s info will appear on the monitor. Click on the screen to advance the info that is on the screen about Frankie. You have to build a solid line between the first entrance on the left side of the page and the exit on the right side of the page. You don’t have any control over the pieces that are on your cursor. You have to either use a piece that is on your cursor or throw it away. If you decide to place a piece on the road, you cannot move it again. At a certain point (when the meter turns red) the car will come out of the left side of the page onto the part that you’ve already built. If the road is not completed at that point you can continue to build the road as the car is traveling. However, if the car reaches the end of the line and the road is not complete you will have to start over. Grab the umbrella that is inside the trashcan. Click on the ladder and a rod will fall to the ground, pick up the rod that falls to the ground. The rod will fall on the lower left side, in front of the small garbage can. Click on the brick that is on the lower left side of the trash can and the word “OK” will appear. The brick is blocking the trash can so you need to click on that so the large trash can will move. 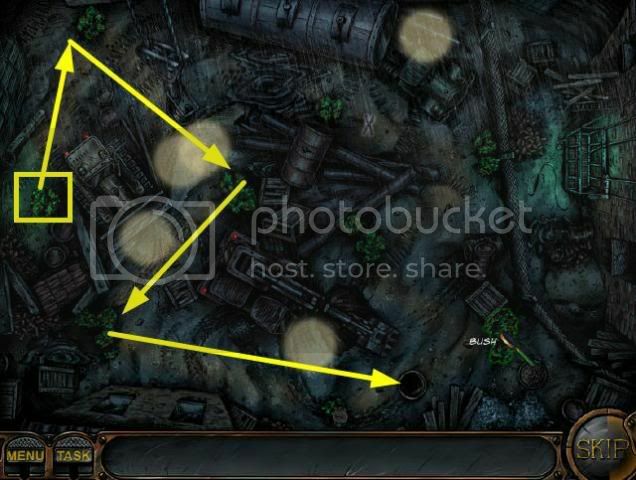 Click on the trash can and the bin will move closer to the ladder, grab the bullet that is against the wall. 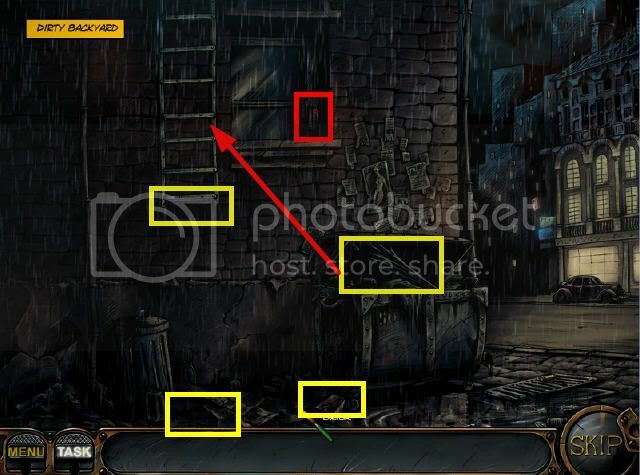 Place the umbrella on the ladder that is on the left side of the scene and the ladder will extend. Grab the rod from inventory and place it on the alarm box and you will get another scene. 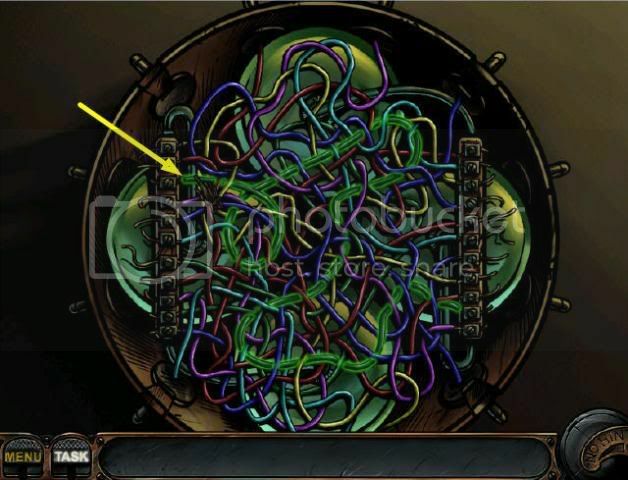 Click on a circle in order to rotate it.You have to connect all the wires until all the light bulbs light up and both ends of the wires are connected. 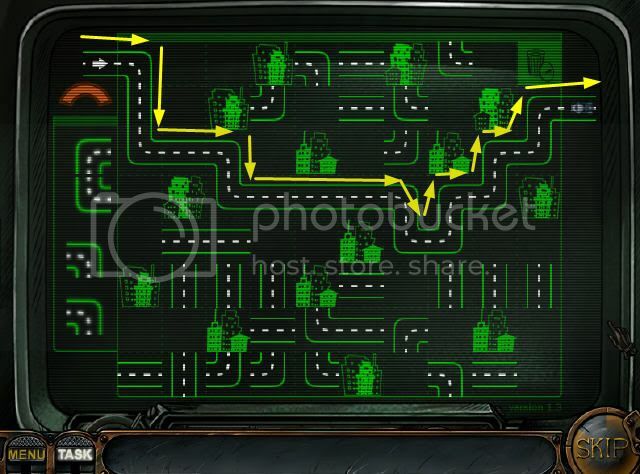 You will know that all the connections are correct when you see the green light come on. The solution in the screenshot should be the same for everyone. FRANKIE THE FATSO’S ROOM-FIND AND OPEN THE SAFE. 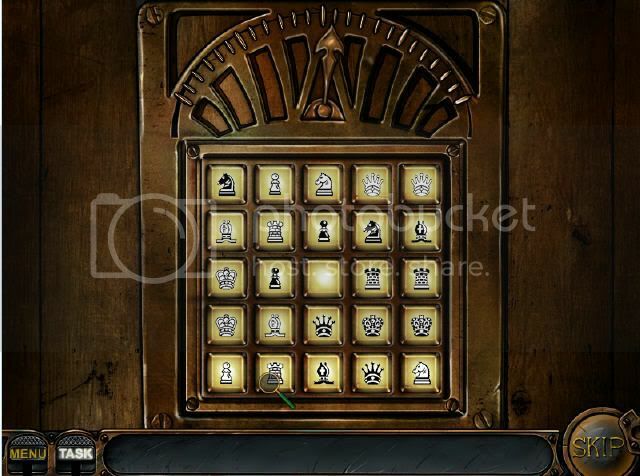 Click on the statue of liberty that is on the left side of the page and the game will tell you that you’ve found 1 out 4 levers in the game. Click on the gold golf club that is in the golf bag. 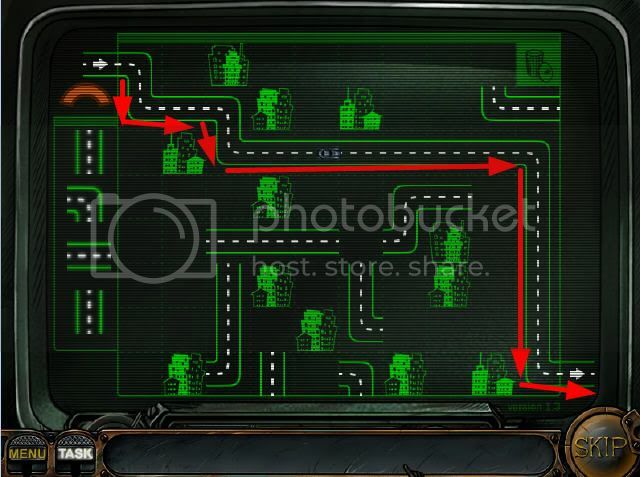 Click on the steering wheel that is on the right side of the scene, on the wall. 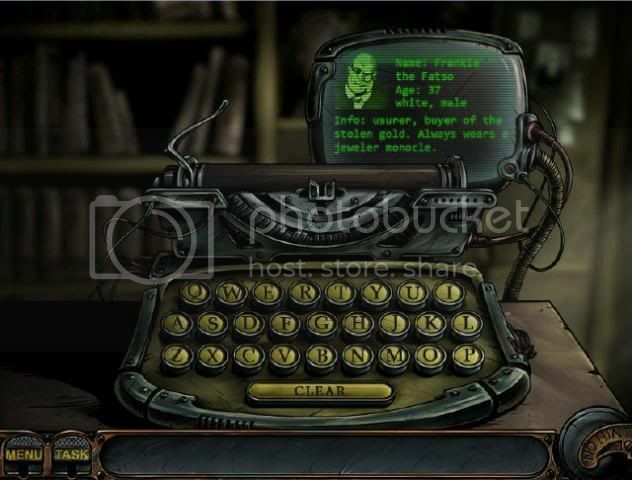 Click on the jack in the box that is on the left side of the desk. Click on the large painting that is on the back wall and you will see a combination safe.Click on it to see a closer view. 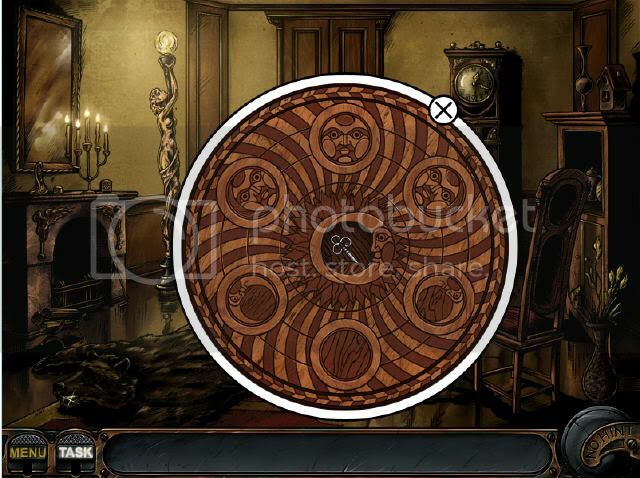 Look for the pattern for the buttons somewhere in the room. The carpet has the pattern for the safe. Enter the pattern that is on the carpet on the keypad to end the level. Make sure that you click on the safe to grab the item that is inside of it. In this scene you have to wait for the sun to go down before you can do anything in the scene. Click on the newspaper and you will get a closer view of it. 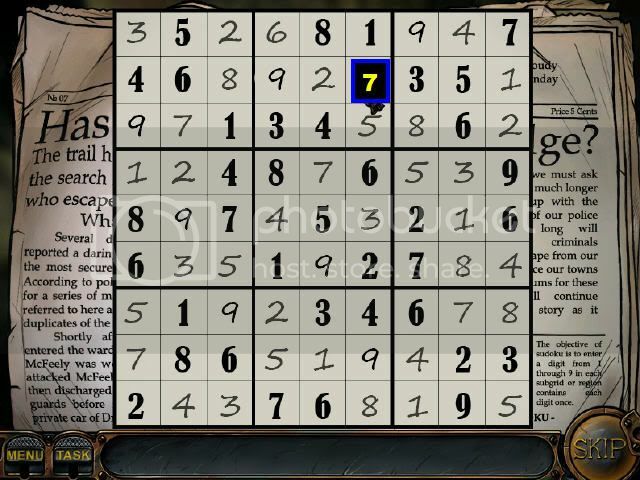 Click on the lower right corner where you see the Sudoku puzzle. Click on the screwdriver that is on the nightstand, by the bed. Click on the curtains to close them. 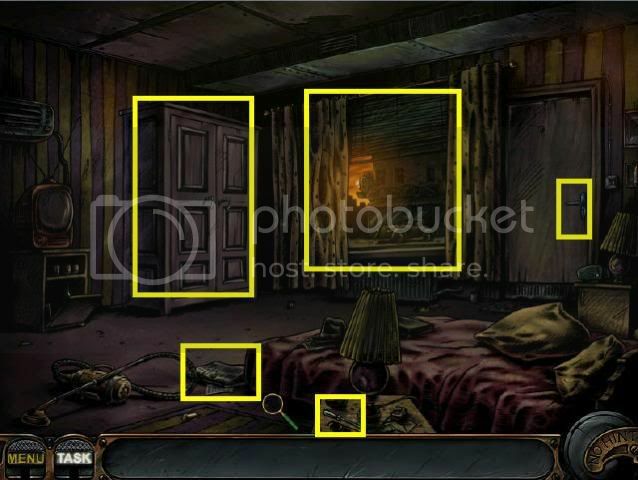 Click on the lower left side of the dresser WITH THE LIGHTER. Nick will say that he feels a draft, drop the lighter back in inventory. 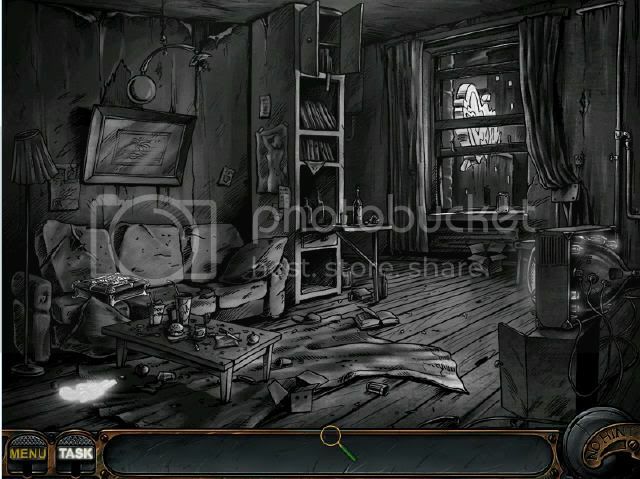 Then click on the lower right side of dresser again but without the lighter and it will move to the side, revealing Graham’s door. 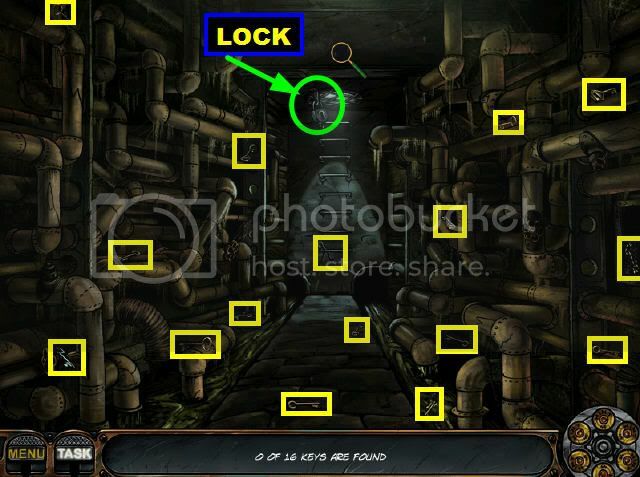 Click on the door that is on the RIGHT side of the room and you will get a closer view of the lock. Place the screwdriver on each screw until one by one they all come off. The handle will go into inventory. Place the handle on Graham’s door and then click on it and you will get a combination lock. Click on the lock and turn it clockwise until you hear it click, wait for the lock to drop. Click on the lock again but this time turn it counter-clockwise until you hear it click, let the lock drop. Lastly, click on the lock and turn it clockwise until you hear it click and let the lock drop one last time. In the video, it may look a little confusing since I wasn’t letting the lock drop before I turned it again, just keep that in mind when looking at the video. In this scene, you have to lay 3 pieces of the road at a time. Each time you drop 3 pieces on the road, your opponent will do the same. The goal here is to lay the road down just right in order to catch up with your opponent. Whatever tracks you don’t want to use must go in the trashcan. 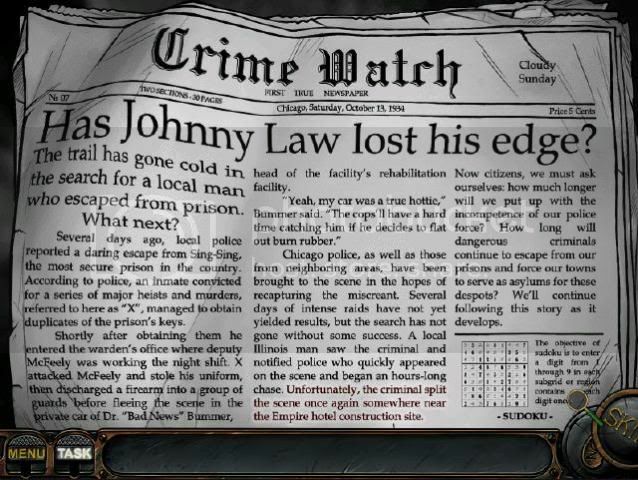 In this scene you have to recreate the newspaper by sliding the pieces around until they look like the picture in the screenshot. 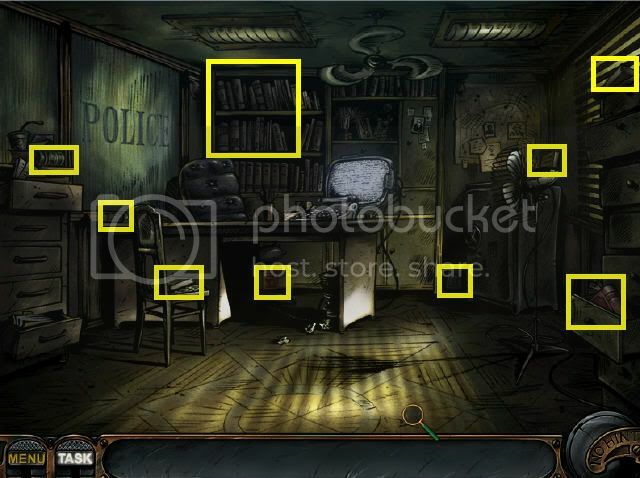 Just click on any square that has an empty spot next to it and the piece will move to the empty spot. Click on the bushes that are in the scene in order to move Nick safely over there. You have to be careful that you don’t move him at a time in which one of the spotlights will focus on him or the cops will catch him and take him away. It is best to look at the pattern of the lights and move Nick when the spotlights are far away from the next bush that you plan to take him to. Please look at the screenshot for the best way to proceed. Once you get to the end of where the yellow arrows are pointing to in the screenshot you will enter the devil’s hatchway. 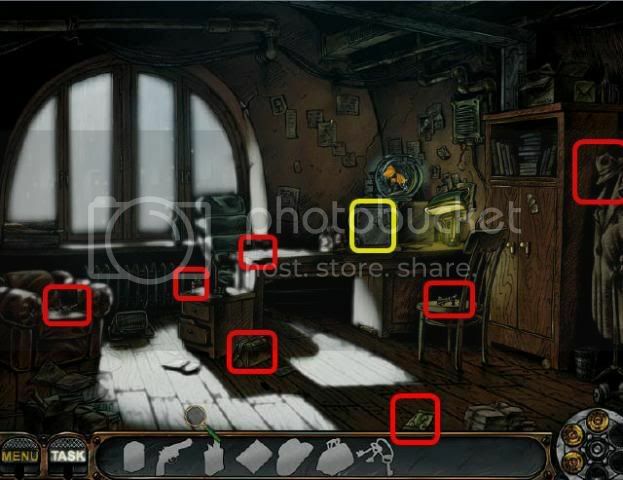 Please look at the screenshot for the location of all the keys. Once you’ve collected all the keys, they will appear in inventory. Place the keys on the lock that is on top of the scene, by the ladder and you will be back outside. As you pass through the yard you will pick up the shears that are on the top right side, they look like an “X” on the ground. It you fail to get through without being caught by the light, you will have to start from the beginning of the yard. 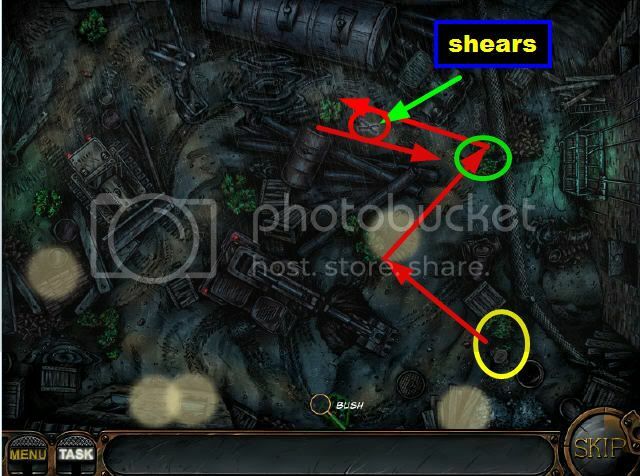 Once you pick up the shears, go back to the last bush that you were on and a mini game will appear. 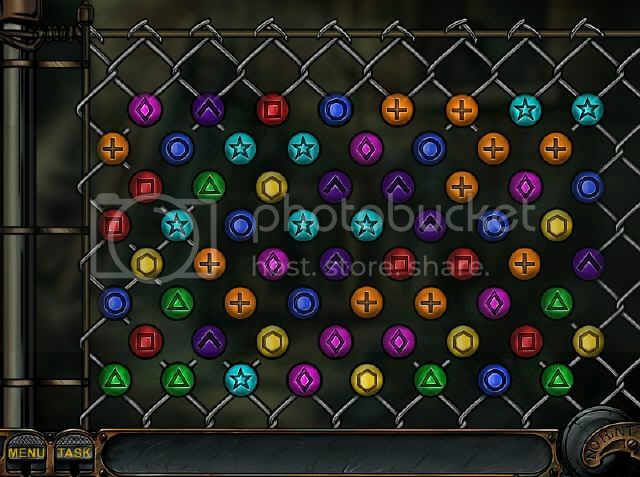 This is a typical match-3 game, the only difference is that you have to drag a row in order to slide towards other gems that match it. Your goal is to eliminate all the pieces of the fence so Nick can get through it. Click on the hoisting motor that is on the right side, under the window and you will be asked to find 13 gears. 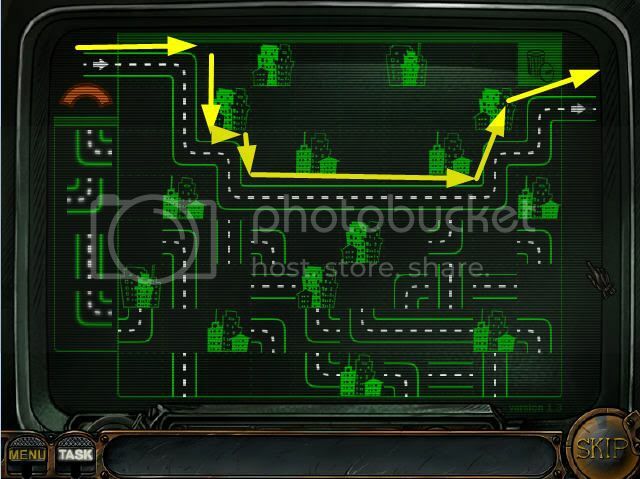 Please look at the screenshot for all 13 gears. Place the assembled gear on the hoisting motor and you will get a new scene. 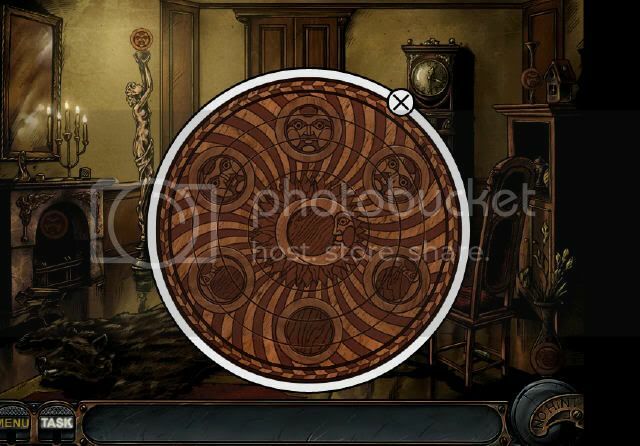 Click on the table and solve the circular puzzle by spinning the inner circles around until everything is lined up. Once all the pieces are correct, the puzzle will spin around and you will see a different view of it. Pick up the 6 lunar symbols around the scene. When you click on the lunar symbol that the statue on the left is holding, it will fall down to the ground and break. 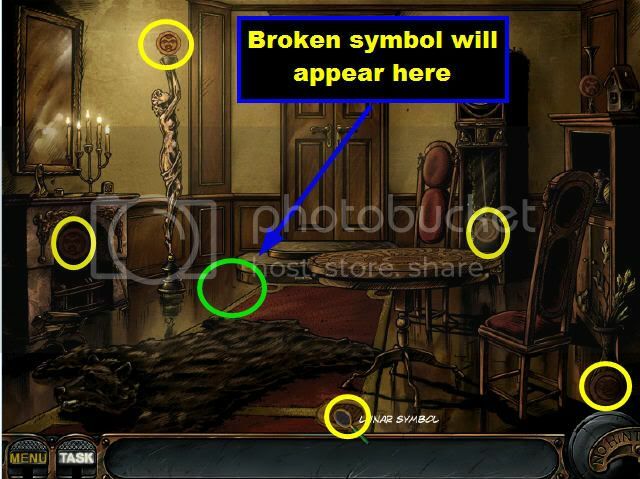 Click on the broken lunar symbol that is on the left side of the floor and put the pieces back together. Click on the round table again and now place all the 5 lunar symbols that you have in inventory on the circles that are inside. 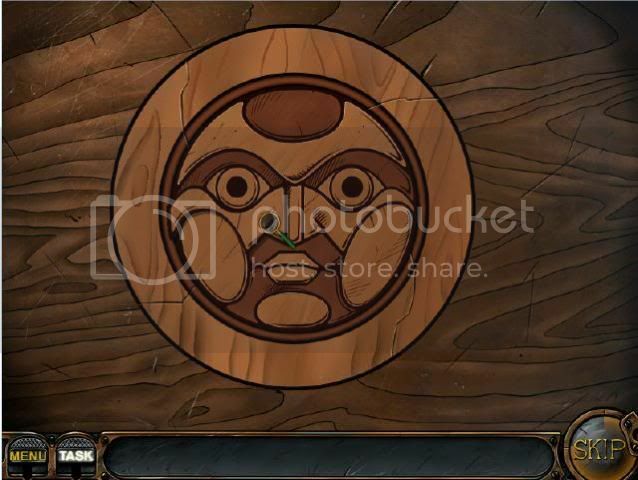 Place the pieces on the matching circles that are on the puzzle. 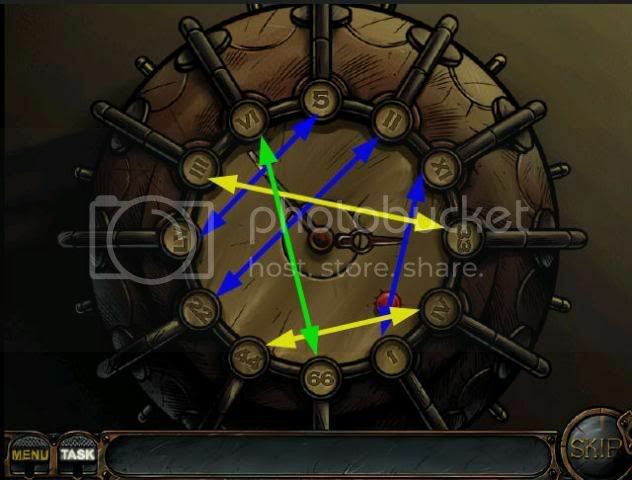 Once all the pieces are inside, a key will appear in the center. Close out the window and place the key on the door to complete that level. 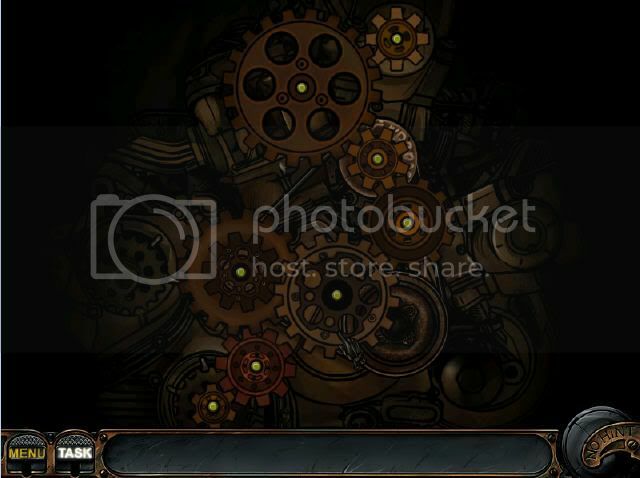 In this scene you need to turn off the valves once the steam has let up. Look for the gauges that are not moving and then click on the valve that is connected to it. 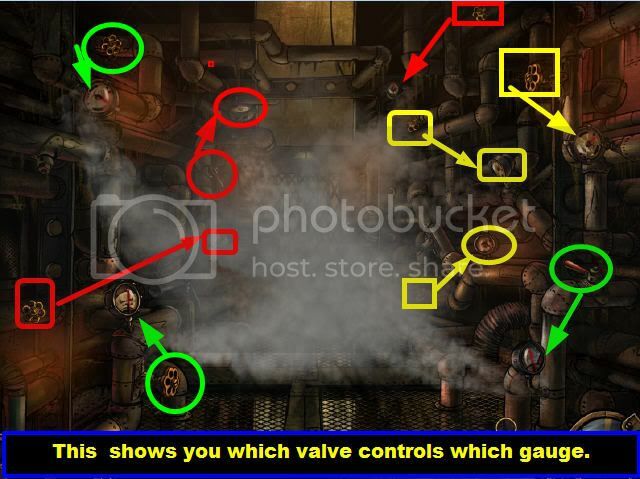 Please look at the screenshot and you will see which valves are connected to specific gauges. 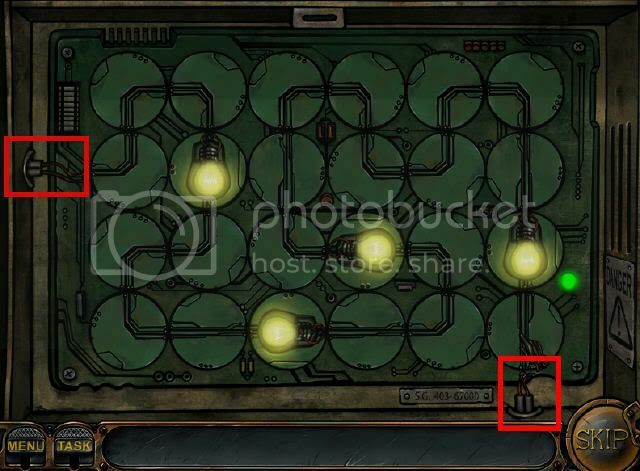 Once all the valves have been shut off, click on the elevator’s up and down buttons and you will see the cables coming down above the elevator.Click on the door to bring up a mini puzzle. 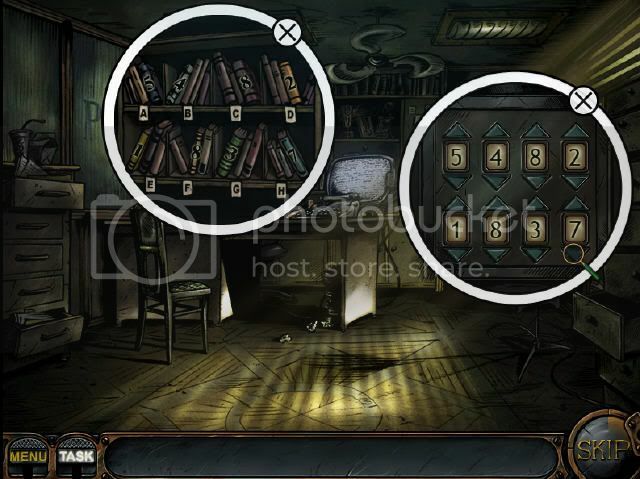 There are three different sections that you must solve in this part of the game if you want to move the elevator upwards. Each section will be explained separately, some with videos, some with screenshots. In this section you need to push on the buttons in such a manner that at the end all the buttons are lit. When you click on one button, it affects other buttons in the area. To reverse a step that you did not want to make just click on the last button that you pressed. If you look at the screenshot provided you will notice that there are 3 buttons that are highlighted. In the end those will be the 3 buttons that need to be pushed in order to keep all the buttons lit. In order to accomplish that you will have to make a series of moves that will free up those particular buttons so you can press on them. 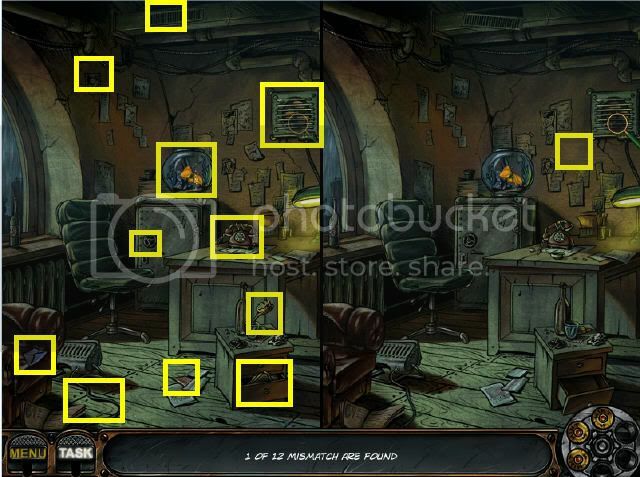 In this instance you will need to click on the buttons, look at the images that are on them and find their match. The solution to this puzzle is random so there could be many different solutions. 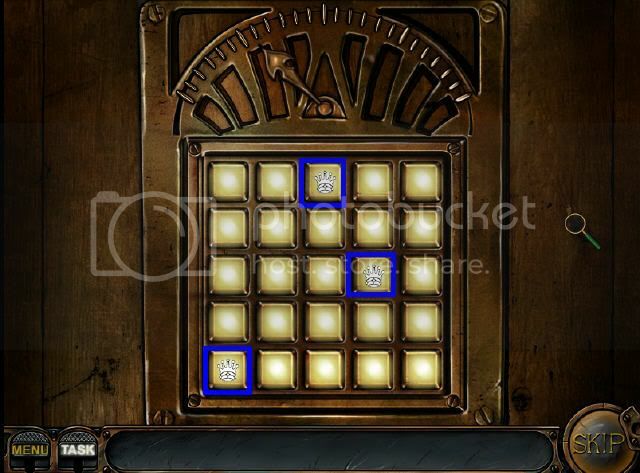 This puzzle works pretty much in the same manner as the first puzzle in this section. 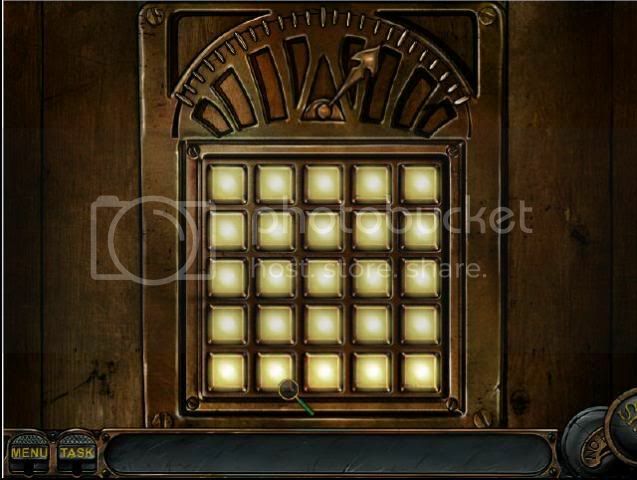 Your goal is to press on the buttons in such a manner that all the buttons are lit in the end. Please look at the video provided to see an example on how to accomplish this. Click on the blinking red light and you will see a new window open up that contains a clock. The goal here is to pair up the Roman numerals with the Arabic numbers. All you have to do is place the minute hand and the hour hand on the two numbers that match. It doesn’t matter which hand goes on which number as long as the numbers match. 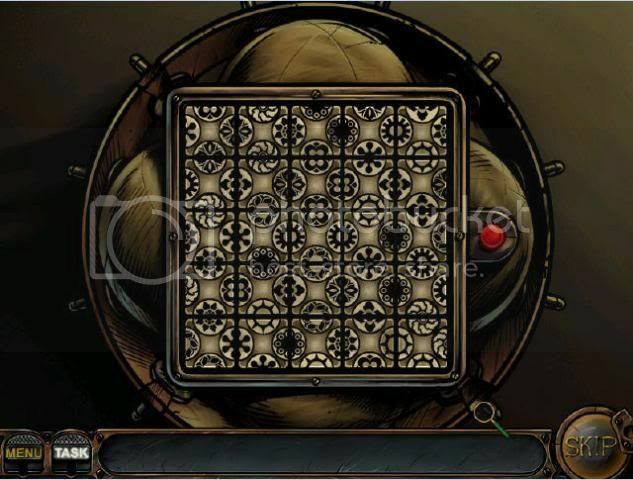 Once all the matches have been made, you will be taken to the next puzzle. 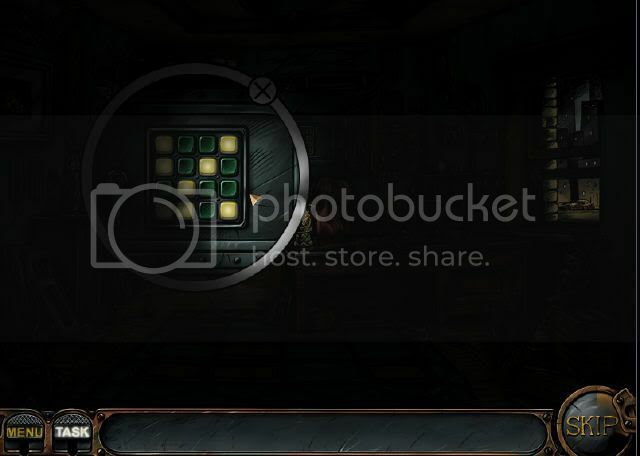 You have to click on the tile in order to rotate them. Your goal is to place all the tiles in the right order. 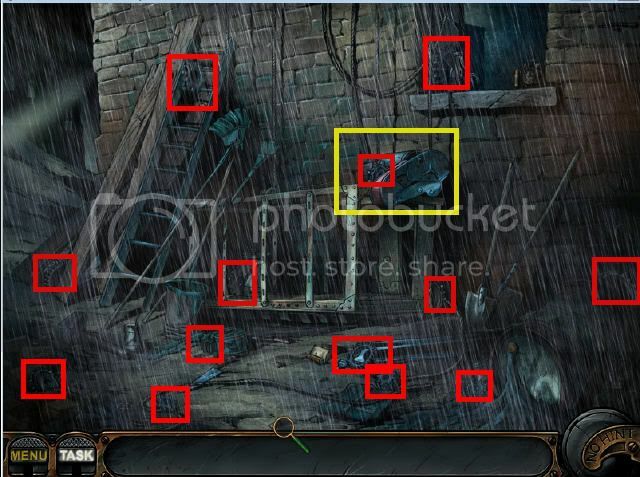 Once the pictures are all in place then you need to click on the red button so you can move on to the final puzzle. The objective to this is to find the wire that is connected to both sides of the connection. This puzzle seems complicated but it is actually very simple. All you have to do is click on the first green wire that is on the left side of the page. Have you ever tried the gamehouse free trial? I heard the games are very addicting. That might not be a good thing lol! Have a nice day! What about the crossword puzzle answers?